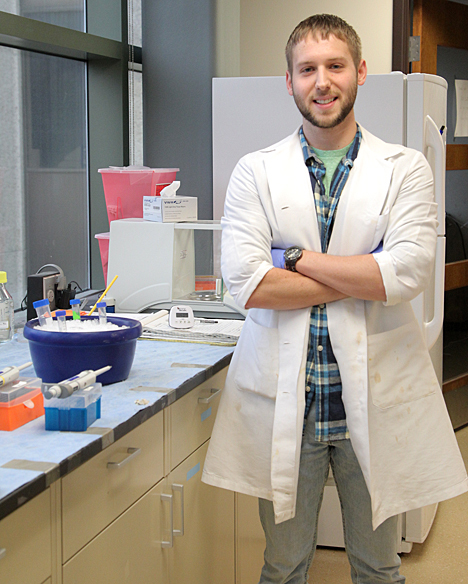 Kevin Nash, a doctoral teaching assistant in The University of Toledo Department of Pharmacology and Experimental Therapeutics, has received a Pre-Doctoral Fellowship in Pharmaceutical Sciences Award for his research in rational drug design and chemical synthesis with a focus on neurology. The American Foundation for Pharmaceutical Education presents the award to students in a graduate doctoral program in either pharmaceutical science or clinical pharmaceutical science who have potential to contribute to the field and ultimately impact patient and public health. Nash is among 38 students who received the nationally competitive award, which includes a $10,000 stipend that he will use toward purchasing supplies for his research. “My project is on stroke research; stroke is the fifth leading cause of death,” Nash said. “There’s really no treatment for stroke right now other than restoring blood flow, but cutting off blood flow to the brain for even a few minutes causes severe cell death, and there’s no treatment to stop that cell death and to protect the neurons from dying after the blood flow has been cut off. He is conducting his doctoral research in the laboratory of Dr. Zahoor Shah, associate professor in the UT Department of Pharmacology and Experimental Therapeutics. Schiefer is an assistant professor in the UT Department of Medicinal and Biological Chemistry. The American Foundation for Pharmaceutical Education is a national organization dedicated to advancing and supporting pharmaceutical sciences education in the United States. For more information on the foundation, visit afpenet.org. This entry was posted on Friday, January 22nd, 2016 at 3:42 am and is filed under News, Pharmacy and Pharmaceutical Sciences, Research, UToday .